Is your home feeling cluttered? Is the garage in need of a clear out? Do you need to dispose of garden waste/rubbish or need to rid yourself of the waste from a project or renovation on your home and don’t know where to start? Diamond Waste has a team of specialist waste collectors to clear your rubbish from any location in London, Surrey and Kent. See what areas of London we cover. 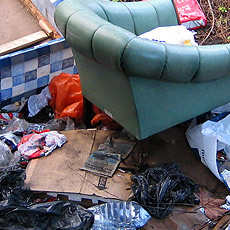 We can collect anything from your property including furniture, garden refuse and refurbishment waste. There is no need for skip permits to be arranged. Diamond Waste is a great alternative to skip hire and we are environmentally friendly. All waste collected is diverted from landfill and is recycled. Our rubbish disposal experts will arrive when it is convenient for you. We will give you a free no obligation fixed price quote and if you are happy we will start work straight away. Book online. We will load everything onto our vehicle and tidy the area upon completion. Diamond Waste Services will then recycle or dispose of your waste in the most environmentally friendly manner possible. If you were considering van or skip hire think again, we offer a faster, reliable and cheaper alternative. Our unbeatable pricing and great service will make your domestic clearance hassle free. See also commercial waste solutions.